Bring mixture to boil stirring until sugar is dissolved. Add cranberries and simmer, stirring occasionally, until berries just pop -about 10 to 12 minutes. Stir in zest and let cool. This mixture will store in the fridge for a week, it’s great served with plain yogurt, sweet potatoes or with low-fat cream cheese on whole grain toast. If you want your kids to try it -make sure they’re involved in preparing it! Watch your portion size when it comes to dried cranberries, unlike raisins which have no added sugar, dried cranberries contain added sugar to make them sweet, which can increase your risk of dental caries. Choose fresh or frozen unsweetened cranberries for your best choice. 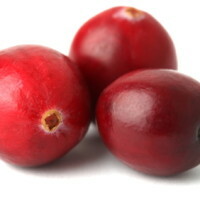 Learn more about cranberries benefits and how to eat them.